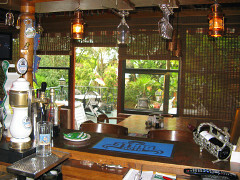 A place to eat, drink, relax, and sample the warm hospitality and creative cooking of host and hostess, Willy and Jessica. A wonderful mural will keep your eyes busy, and the great cooking will definitely keep your mouth busy! 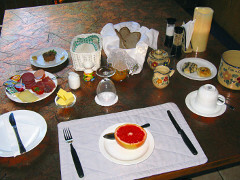 Breakfast, lunch and dinner are served here, on the sunny front terrace, or in the sheltered rear terrace. Every meal is prepared with pride in the knowledge that the finest ingredients have been used to produce dishes for those who enjoy good food in a cosy atmosphere. Willy, hailing originally from East and West Berlin, specialises in delicious German fare. The Legere Stube is open from Monday to Friday or as otherwise arranged. Please notify us in advance if you intend eating with us. All guests are welcome to make use of the Legere Stube in-house restaurant and bar, where you may choose from an a la carte menu. 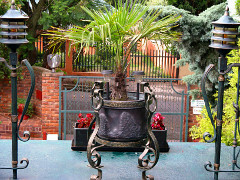 We serve lunch and dinner, with Gluehwein in winter, or with a sundowner on the terrace in summer. 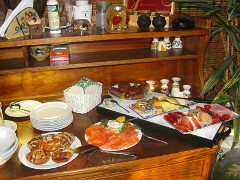 Specials meals will be prepared on request, and a cold platter will be made available in your room by prior arrangement. 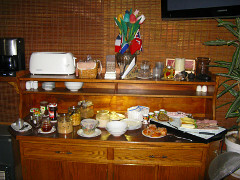 Please note that only Continental breakfasts will be served on Sundays and public holidays, except where other arrangements have been made in advance. Non-residents are also welcome in the Legere Stube! A cosy corner. 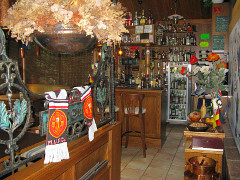 The bar area. Entrance to the Legere Stube. View from the bar to the terrace. The front terrace. Sunday Continental breakfast. Single Sunday breakfast. Copyright © 2008-2018 Willy's Chateau Web development by Barbara Ross-Adams.